Magento Password strength meter brings user interaction with forms. 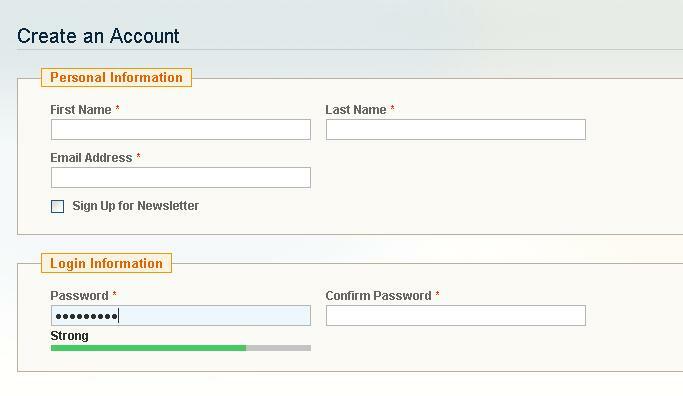 Magento provides built in support for form validation. However if it provides a nice Interactive validation response it would increase the user experience. Lets say while creating a password it would be nice if the user gets to know about the strength of his password. library we follow the prototype style code implementation. Step 4: The above code snippet gives hints about the strength of the password he entered. if the password contains less than 6 characters it would indicate the password strength as Weak, if the password is more than 6 characters and also have lower case and uppercase characters with numeric digits it is considered as strong password. Thanks for sharing the informative post. This is very useful to implement the password strength.